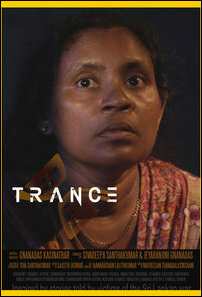 “Uru” (Trance), a short film shot in Batticaloa by a native Eezham Tamil cast and crew from the island and which was inspired by the stories of long enduring sufferings of the enforced disappeared families, has been acclaimed with global recognition from the Best Short Film Competition in California in September. Subsequently, it also won the award for 2017 Best Human Rights Short Film at the London Eye International Film Festival. The story writer and director of the film, 49-year-old Gnanadas Kasinathar, narrates the depth of psychological disaster as witnessed by him on the ground. Behind every act of structural violence and discrimination against the Tamils, there is a deep-studied psychological phenomenon, carefully hidden by the SL State mechanism, the artist says narrating the examples in a recently recorded interview with TamilNet in London. His interview, focusing on various topics of structural annihilation taking place in the island, also brings out a lesson that it is ultimately the Eezham Tamils themselves, and no-one else on their behalf, who should be owning their struggle and defining the course of future action. From the dismantling of Tamils' ownership to their nature and to their ecosystem to the ‘management’ of various crises, the SL State and its backers seem to have carried out a well-studied psychological programme, which is going against the interests of Tamils and to the advantage of the whims and fancies of the SL State, the artist implies. Eezham Tamils, as a community, are now starting to realise these dangerous trends as evidenced in their responses to the recent deprivation of the so-called socio-cultural actions coming through the SL Judiciary. Everything from the laws criminalising animal cruelty, which target to dismantle Tamils‘ traditional worship of deities to the latest move of getting rid of Palmyra toddy, is carefully planned to dismantle the interaction of Tamils with their nature and their ecosystem. On the theme of the short film, nothing has been done so far to genuinely address the psychological trauma of the families of enforced disappeared by the SL State and the Tamil parties, Gnanadas says. The role played by the NGOs has been of an exploitative character and the Sinhala outfits coming to North-East staging dramas and dances claiming to heal the wounds of war have all been absurd parodies, he adds. It is those who are genuinely concerned of Tamil nationalism, who can shape the course of action, Gnanadas says. The short-film was an attempt to convey the message to the community with an embedded question on what should be done. “Uru” short-film touches on the role of Vaakkuch-chollal, the trance possession of Goddess Kaa'li, as a form of healing the psychological scars in the absence of other forms of native responses to the crises. Gnandas, who hails from Jaffna is based in Batticaloa. He has been a long-time Eezham cini activist, promoting independent film-makers among Eezham Tamils with an orientation to convey powerful stories of the people without succumbing to propaganda film-making. He has been actively involved in the field since 2002 with an involvement in UK-based ScriptNetter. He has also studied screenwriting for films, with a Master’s degree from the Bournemouth University in UK. Although Gnanadas has worked on feature films such as Pooppeythum Kaalam and short films Mookkup-pea'ni and Cheruppu in the past, “Uru” is his first film in which he has taken the role as both the writer and its director. Gnandas identifies Eezham Cinema as a unique genre, even differentiating it from Ilangkai Tamil films. Artists like Gnanadas, conveying the message from the grassroots of the Eezham Tamils, contribute to evolve the unique identity of the still-emerging Eezham cinema, which has its origins from the national liberation struggle of the nation of Eezham Tamils. The short film has been shot at Muthalaik-kudaa, Kurukka'l-madam and at Paavatkodich-cheanai in Batticaloa. நொறுக்கப்பட்ட மாவீரர் துயிலுமில்லங்களே இக்கூற்றுக்கு இரத்த சாட்சியங்கள்! காலூன்றி நிற்பதனால் வந்த கோபாக்கினியோ என்னவோ? Becoming entranced is the a vision of life in a country where the legitimacy of “habeous corpus” has become redundant currency. A popular uprising may be the only dam for the rivers of tears shed by the grieving mothers in a country where the war criminals are sitting on the throne. Is it our fate to repeatedly hear mad pronouncements like: “They are tigers, they can’t be released” and mockery like “Search for them in the foreign countries”? The state even refuses to acknowledge the falling of our sons, in a land where we have the sacred tradition of offering felicitations for departed souls. The “Dutugamunus” don’t have the grace to offer a tribute to the “Ellarlars” even after ten years have lapsed since the end of the war. Such pride, Such arrogance! The destroyed mausoleums of our fallen martyrs alone bear witness in blood to this arrogance. Like the proud proclamation of Raavanann at the end of the cosmic war “I may not have won, but I will be forever remembered as long as the sacred scriptures exist”, we stand firm , in the knowledge that we are justified in our righteous fire of rage that we kindled from the heritage of our martyrs, by enduring the assault of the noxious gases, by our hellish anguish, may be this is the entrancement. Witnessing and spreading the word about this anguished howl of a screening is our commitment to our fallen guardians who have been lost; it is the light that has been handed over to us by our age. 17.12.17 Enduring psychological disaster of families of enf..
15.03.10 ‘Vanni Mouse’ wins best fiction award in internati..
02.10.09 Eezham Tamil filmmaker’s debut reaches internation..